Bina and Stephen Bilenky. Photo from Embrocation Magazine. Bina Bilenky is a busy woman. She helps run the family business (Bina is the daughter of noted framebuilder Stephen Bilenky), writes a column for Embrocation Magazine, is the co-founder and organizer of the Philly Bike Expo, founder and organizer of the Heartland Velo Show, and helps organize the San Diego Custom Bike Show. We talked about her experience growing up with an important framebuilder for a father, her work at Bilenky, and her notable attraction to bike shows. Given who your dad is, it’s not really any wonder how you got introduced to cycling. So instead, what are your earliest bike memories? My earliest memory was riding with my older sister on our little Schwinn’s down the sidewalk by our house. A more vivid memory – probably because I was older, I think I was 9 or 10 was riding a Bilenky tandem with my dad for a bicycle feature on cable TV. I’m pretty sure the bike was set up kiddie stoker style. My favorite bike memories all start later in life (when I was 19 or so) and got my first Bilenky touring bike. Then the real fun began. What was it like growing up with an iconic framebuilder for a father? Did you get into cycling early on or did you rebel against bikes the way kids often rebel against the things their parents like and do? I didn’t get into cycling until I was a teenager, but I didn’t rebel either. Even though I wasn’t biking early on I helped my dad out at the shop as soon as I was old enough to sort bank slips for him. I didn’t get my first Bilenky bike until I was 19. Production time is much longer if you are family–kind of like the shoemaker’s kid having no shoes–so I attribute that to not getting started on cycling earlier. Why would I ride someone else’s bike? Fully prepped for the zombie apocalypse. 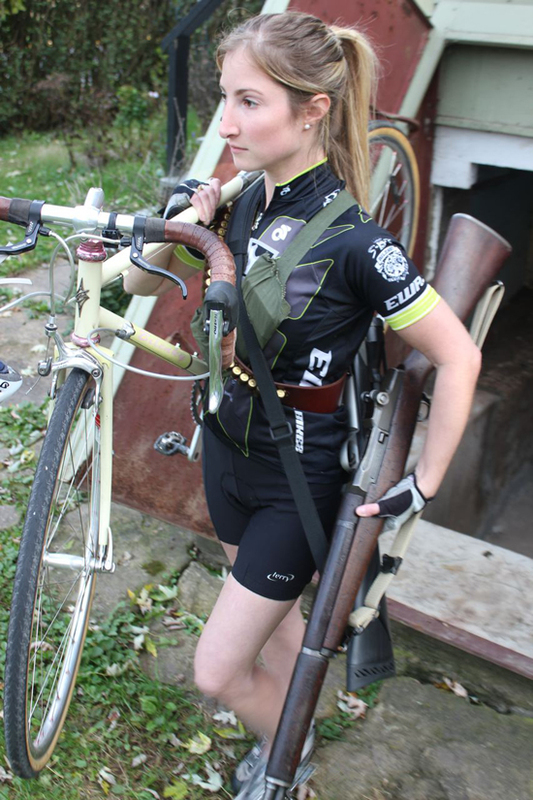 Read her advice on bike’s as an escape tool for when the apocalypse arrives. You’ve entered the family business, but I gather you yourself are not a framebuilder. What do you do at Bilenky Cycle Works? Do you ever see yourself picking up the brazing torch and following in your dad’s footsteps? I tried brazing in an art class once. It didn’t go well. Besides burning holes in all my favorite t-shirts, my grandmother was the only one kind enough to display my sculptures made from scrap bicycle tubing. I have done a little of everything at Bilenky Cycle works (besides building bikes!). Bookkeeping, customer service, marketing campaigns, planning events, which got me to where I am with organizing the Philly Bike Expo. My first Bilenky event I planned was our epic “Framebuilder Express” train trip from Chicago to Portland for the 2008 NAHBS. We had a group of 20 or so wild and crazy framebuilders who joined us on Amtrak’s Empire Builder for a couple nights of shenanigans and talking shop. Last year was the Philly Bike Expo’s first. I’m pretty sure I read somewhere that you wanted to foster a non-competitive atmosphere for the framebuilders, which seems like a direct response to shows like NAHBS and Oregon Manifest. What do you think is gained by not having competition between the builders? Fostering a non-competitive atmosphere may have floated around in our original mission statement, but basically our vision was to promote bicycle culture in all its facets, rather then a gathering limited to bona fide craft handbuilders. Having framebuilder awards didn’t seem to make much sense, since most of our exhibitors aren’t framebuilders. Perhaps, having awards for the best behaved exhibitor or best facial hair might be fun. That said we want to showcase framebuilders, since they are the bleeding edge of bicycle culture. Also, being the cycling world’s starving artists (which probably also includes many clothing and bag makers) we wanted to have a show that was affordable, fun and easy to attend. 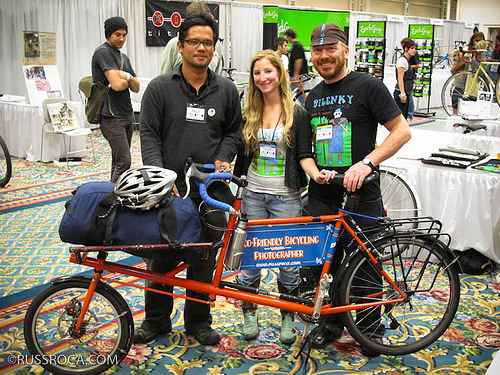 Bina with former Bicycle Story interviewee Russ Roca and the cargo bike Bilenky built him for his photo business. Photo from Russ Roca’s flickr. Since that first Philly show, you’ve gotten involved in two other bike expos in San Diego and Madison. How did you get involved and what is it about bike shows that compels you to help organize them around the country? I was sort of drafted by builders in those areas to jump in and help them improve and start their regional shows. It’s sort of an extension of “those who can’t do, teach” It’s fun to bring bicycle products and culture to seasoned cyclists and those who are just beginning. Besides, it’s rewarding to use my organizing skills to produce events for people and products that I know. (I even planned my own wedding). Traveling is also one of my favorite hobbies! This year’s Philly Bike Expo is just around the corner (Oct. 29th and 30th for those of you in the area). What do you hope to accomplish with this year’s show? What comes next for you one you wrap up this expo? 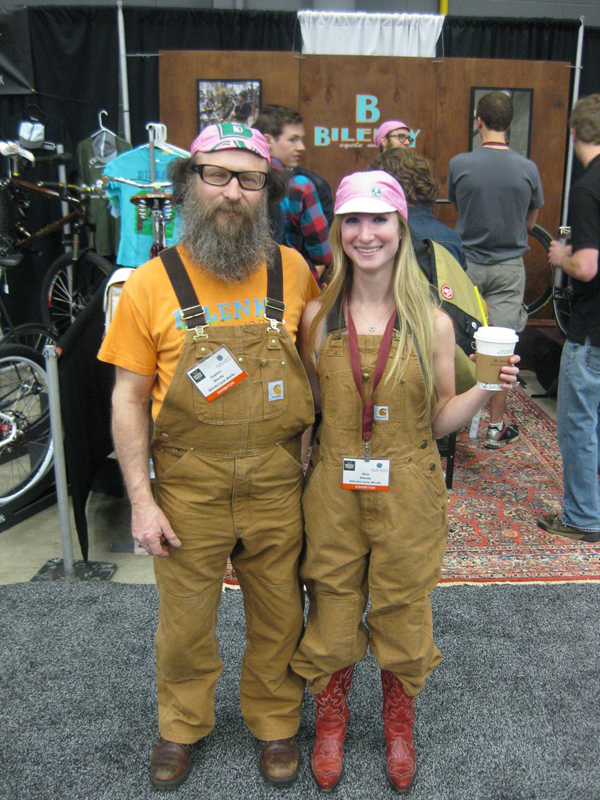 This entry was posted in Bike Industry, Frame Builders, Interviews and tagged bilenky cycle works, bina bilenky, heartland velo show, philly bike expo, san diego custom bike show, stephen bilenky. Bookmark the permalink. Dad must be very proud! I like the idea of non-competitive shows. It can make for a much better environment for sharing, learning, and improving. was your father born in GOloskow/Guershon or his family was from that area? You can be proud of his tasks and yours.